Pauline Samways, together with the Motueka Arts Council, has greatly increased local community awareness of godwits: birds who complete their non-stop migration from Alaska to here in New Zealand. Pauline was recently recognised as a Conservation Champion for her tireless work in helping raise the profile of Motueka’s most important annual visitor. Just over ten years ago, Pauline left the classroom behind after being awarded a Science, Mathematics and Technology Teaching Fellowship by the Royal Society of New Zealand. This allowed Pauline to spend a year on the Motueka sandspit learning about its ecology. It was this experience that made Pauline realise just how truly amazing godwits are. 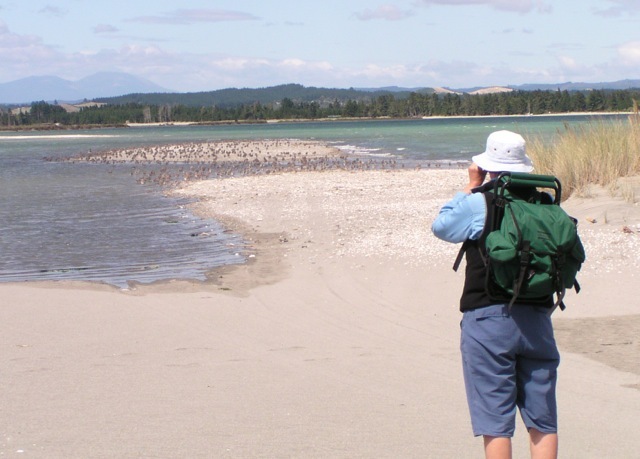 After following the progress of the satellite-tagged birds, Pauline saw how important the DOC managed Motueka sandspit was to the long-haul travellers who nested there. After her submission to the local council to ban dogs from roaming on the spit was unsuccessful, Pauline wrote articles for the local newspapers about the different birds that were found on the spit and relied on it for their survival. Her submission was later revised and the last 200 meters of the sandspit are now dog free thanks to her efforts. In 2008 the Motueka Arts Council joined the unofficial Godwits Appreciation Club whilst looking for a new project that would be special to the Motueka Township. They came up with the idea of a ‘Welcome to the Godwits’ celebration—an exhibition of art, photography, poetry and sculpture by adults and school children, along with information about the birds and the importance of the estuary. “We visited schools to enthuse the children who in turn carried the message to their parents,” says Pauline. 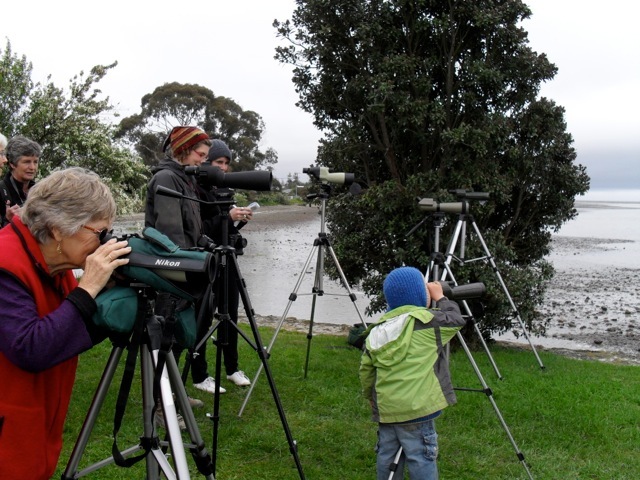 Pauline’s own “Viewing of the Godwits” event saw local Ornithological Society of New Zealand members set up their telescopes on the old wharf over-looking the estuary. People came out to view the godwits feeding and to hear about the amazing journey they made every year. The “Viewing of the Godwits” event paired up with the Motueka Arts Councils festival for three years following its debut and included guest speakers, a dress up parade and art on the waterfront. These events encouraged one local school to publish a book (called ‘Never Ending Summer’) on the topic with the first 200 copies selling out. In the past three years, a colony of white fronted terns has been nesting at the end of the sandspit. To help manage these predators, DOC provided Pauline with six traps, which she and a friend now monitor regularly. 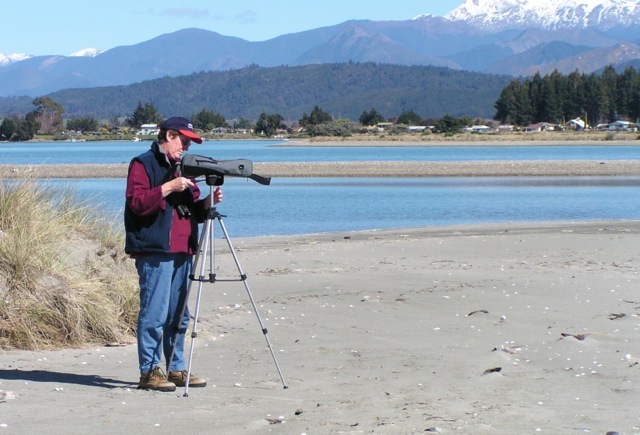 The increased awareness of godwits in the Motueka community is greatly due to Pauline’s hard work and her partnership with the Motueka Arts Council, as well as the support from DOC and the Tasman District Council. Pauline has been the community voice working in a methodical and persistent fashion in the best interest of the birds. It’s the quiet, unassuming style that has allowed her to succeed where others have failed.